The LP and S series wrenches from Enerpac. ENERPAC’S new professional bolting technology streamlines many of Australasian industry's most common, time-consuming and potentially hazardous maintenance and fabrication tasks. The LP and S series of compact but extremely powerful high pressure (700 Bar) hexagonal and square drive torque wrenches address the needs of major areas of industry, including mining and energy, infrastructure construction, manufacturing, pipelines, mobile machinery, tracked and heavy vehicles, craneage and fixed plant. The new wrenches - complemented by Enerpac's advanced pumping technology and more than 30 years of application expertise - are designed for maximum durability, reliability and safety, with rigid steel design and outstanding power to weight ratios. The easy-to-use tools are designed to replace laborious, inaccurate and often hazardous bolting and unbolting methods, such as flogging wrenches. The LP low profile hexagonal wrenches for low clearance bolting applications weigh from only 1.4-5kg, yet have terrific and precisely repeatable torque from 2712-20337Nm, while the versatile S series of double-acting square drive wrenches extends from 2.7-31kg with outputs of 1898-34437Nm. The nimble LP wrenches' small nose radius measurements of 31-87.5mm enable them to fit readily into tight spaces with their hexagon range from 36-115mm, while S models offer from 25-63.5mm with square drive range from 19mm to 63.5mm. Both families of wrenches - and pumping technologies such as the new ZU4 variants - are integral components of the new families of Enerpac bolting technologies and application expertise dramatically expanded over the last year when parent company Actuant acquired international leaders in applied bolting expertise, the Hedley Purvis Group and Hydratight Sweeny. The combined Hydratight oganisation formed by the acquisitions works as a team with Enerpac, which focuses on the most advanced and efficient technologies required for bolting. * Fast operation from large nut rotation per wrench cycle (30° rotation angle) and rapid return stroke. No tools are needed for changing heads. * Innovative pinless wrench construction incorporating quick release cylinder and automatic crank engagement. Robust design with minimal parts for easy on-site maintenance without special tools. * Cylinders and low profile heads engineered for ultra-slim compact low clearance tooling with small nose radius. * 360° click-on, multi-position reaction arm and push-button square drive release for quickly reversing the drive for final tightening or loosening. A fine tooth ratchet prevents tool ‘lock on’. 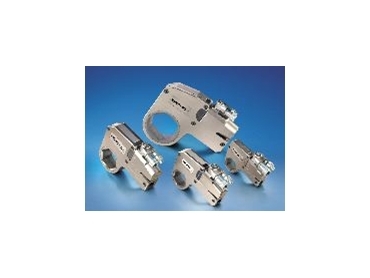 * Compact high-strength nickel plated uni-body construction for a small operating radius. The robust design with minimal parts facilitates easy on-site maintenance without special tools. * Lightweight ergonomic design for easy handling, with an optimised strength-to-weight ratio and fast operation because of the large nut rotation per wrench cycle (35° rotation angle) and rapid return stroke. Constant torque output provides high accuracy across the full stroke of both hexagonal and square drives. An in-line reaction foot ensure accuracy by reducing internal deflections in the hexagonal drives, while uni-body construction ensures accuracy in the square drives by reducing internal deflections. Both torque wrenches come with a wide range of accessories for safety and efficiency in particular applications, including twin 4:1 Safety Hoses. Both can be used with a wide range of optimum electric and air pumps including the latest cool-running and energy-saving ZU4T hydraulic torque wrench pumps designed specifically for bolting applications. The compact and highly portable ZU4T Series electric pumps - weighing between 32-36kg - offer auto-cycle for continuous cycle operations and quick, secure coupling by way of Parker spin-on-couplers for 700 Bar models and Enerpac lock-ring couplers for 800 Bar models. Their high-efficiency, two speed pumps feature higher oil flow and bypass pressure (85 Bar) for cooler running that requires 18% less current draw than comparable pumps.